I have mentioned the good London City food before but after a pleasant flight on a recent Friday I thought I would flag it again. I flew back from Berlin into London City on BA CityFlyer. Club Europe food on City Airport flights is very good. Even for short hops such as Berlin, you get a menu and a choice of two hot main courses. My meal is pictured below (click to enlarge) which was ‘salmon with pumpkin tortellini garnished with asparagus on a seafood bisque’. It was a little overdone but generally tasty. The other option was ‘pork teriyaki garnished with rice and red pepper slice’. The reason the food is good, of course, is that the other Club Europe benefits are minimal. You don’t get an empty middle seat flying into London City as the aircraft are 2×2. Flying outbound, you don’t get lounge access at London City because there isn’t one. 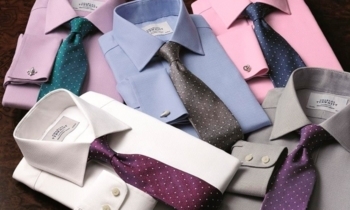 Shirt maker Charles Tyrwhitt is offering a 10% discount on all online orders until 3rd April using code 10OFFMARCH. There is no minimum spend. Tyrwhitt is an Avios partner and you will earn 4 Avios per £1 spent via their website. You can also claim Avios if purchasing in-store although the 10% discount does not apply. The Charles Tyrwhitt home page is here. It is also worth checking out their clearance offers which are here. If you liked the Radio 4 documentary …. Two weeks ago Radio 4 broadcast a 30 minute documentary about frequent flyers and their pursuit of elite status, which included a contribution from myself. If you missed it you can listen here. If you enjoyed it, I also fully recommend “Frequent Flyer – The Video”. It has been about 7-8 years since Gabriel Leigh made it, I think as a graduation project in the US, but it remains a fantastic piece of work. It is a 20 minute piece about collecting airline miles, in particular the people who do it. Rather like the Radio 4 programme, it primarily focusses on mileage running – taking very cheap or multi-segment flights on crazy routings in order to accumulate miles or status points very cheaply. The link to the video is here on Vimeo if it is not showing above. If you’ve already seen it, watch it again – it is worth it for the quality of the film making alone. A planned feature length version of ‘Frequent Flyer’ which was the subject of a successful Kickstarter campaign seems to have hit the buffers, which is shame. Enjoy this 20 minute taster version. What will a fraudster pay for your Avios log-in details on the dark web? Hi Rob, Who did win the United lounge passes,Can you please give the results as I would have to fly with United from EWR and need to consider buying on Ebay if I haven’t made it to the winners list. The winners have been notified although 1 has not confirmed (and will be redrawn tomorrow if we don’t hear). Anika has the names, not me. I’m really curious about this because I have a flight from Heathrow T2 in a few weeks and would love to use the United lounge there. Are the one time passes on ebay OK to buy and use? Or are there any scams going on, such as them being fake or suchlike? Any advice appreciated. The passes are transferable (well, put it this way, they don’t have a name on and United doesn’t control who they are given to by partners like Chase and Hyatt). Plenty of Hyatt status members get 5 per year but never use them – like the person who donated them to us. If an eBay account has sold more than 5 in the past year then it could be dodgy but up to 5 is OK.
That reminds me! I was at first aid course on Thursday and the guy running the event used to work for BA pricing fares/loads. Somehow we got talking about it, and a few people taking the course had heard the show on Radio 4. They seemed to think it was quite good! 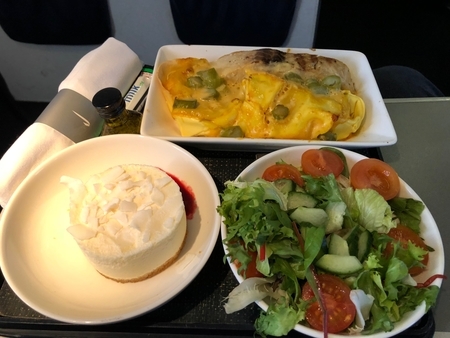 With no middle seat and no lounge access, then that was an expensive meal in Club Europe wasnt it? We’ve a flight back to LCY later today. Already get fast track / lounge / priority boarding etc with status so paying an extra 4k avios (say at 0.75p ea) and £7.50 taxes = £37.70 per person for the CE food really isn’t worth it (though I have burned an expiring upgrade voucher before on the E190 and if you get 2CD it’s rather spacious). I only buy CE for the TPs. I notice that on “commuter” BACF CE flights many passengers don’t even bother eating. Yes, it tasted rather nice, but it was so overcooked that the flesh was grey – I wondered whether they had substituted tuna for salmon? Genghis – there is also the champagne (if timing fits one’s obligations), or do you abstain? @Bagoly I rarely drink on SH. And CastelNOT? No thanks. Each to their own though. I’m happy to pay a bit extra for CE if it’s available at a reasonable price or for Avios. That said the service in economy remains good as they still have a complimentary service so don’t need to faff about taking payment. There was no issue in me requesting a second drink when I travelled EDI-LCY but where there is BoB service that’s difficult as they’re usually still serving. Was that an Avios points upgrade? No that was the difference between Y and J one way. True. The £7.50 (indeed the full £25) got expensed though! @Rob given spending avios is not tax deductible, what’s your accepted selling price for avios for HfP related flights and how does that differ to personal usage? I don’t even try to work it out. Logically …. I should probably have paid for the Marriott in Berlin because the 50% discount I get (factoring in NI as well as income tax) by charging it to the company would have made it better value than points. I didn’t fancy a £600 credit card bill though. And on that basis I’d never spend the points …. and arguably the points come from referring readers to SPG Amex and Amex Gold cards in the first place. It also makes articles messier if have to explain the tax shield every time I use cash when a reader would logically use points. O/T hotel related – looking for a nice hotel in NYC for my wifes birthday in December. I’ve made a cancellable booking at Crosby Street using a booking agent called Grand Luxury Hotels as they offered a number of benefits, breakfast/guarenteed upgrade etc. after joing their ‘club’. I actually thought it was Firmdales own loyalty scheme (my mistake). There have been some discrepencies with the benefits and email to and fro to get things sorted out. Anyone have experience with them? Did I say great video, learned a lot. Hadn’t seen the video before but it’s miles (groan) better than the trite Radio 4 documentary. Radio 4 programme tried to listen several times but gave up, couldnt connect (not internet connection problem) personally to the format, where as this video did work for me! Love the Gabriel Leigh mini-doc. Think I’ll calculate my miles redeemed (Avios) so far after watching that, might be interesting. I would sooner spend less time at the airport so factoring in lounge time is not important. I think it’s great that you can still almost turn up and take off at LCY. The economy product good enough and the leg room decent or very decent if on the larger EMB. Paired seating a bonus if travelling as a couple. It’s a great video. I am glad you shared it. I seem to recall hearing Gabriel Leigh speak at Travel Magic (? think I got that right) in Brussels more than a few years ago. Agree, the quality of the production is spectacular. Of course, it reminds me how much things have changed over the past few years. OT – anyone knows for how long the IHG free night voucher is valid? Also IHG creation was I think launched approx 20 months ago so we are past the time where first persons who took the card for 1 year and tried to churn after 6 months wait for another sign up bonus… any success to report? As for the Amex to Iberia transfer: received my miles on the 10th, but haven’t received a bonus yet. Odd. One guy got them in 5 days. I have nothing in 4 days. I was also curious so I topped up a nominal amount using my IHG card on Friday to test whether it would be treated as cash advance. Currently showing as a pending transaction and no sign of a cash advance fee. Interesting, thanks. Will likely post on my account tomorrow so will report back. I’ve been charged fees with Revolut from Creation at statement date. A no go now. Can you do this using a Curve card as an intermediary and then recharging to Creation IHG? HFP often fails to appreciate that the BA CityFlyer flights operating out of what Londoners call ‘The Regions’, what 87% of us call ‘The UK’, are the last remaining sensible use of Avios. The Embraer 190s are the poor-man’s Concorde. They are almost the same size and layout internally. In business class, there is champagne and better food than available on any other airline operating those routes.